Google announced the Nexus Q – an Android computer sphere built for the home and offering media streaming and social networking features – at Google IO 2012 today. 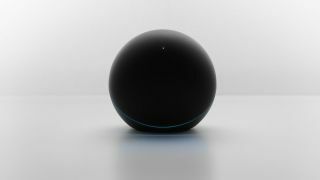 Described as a "small Android-powered computer," the Nexus Q is a nearly spherical device that ties in with Android devices for cloud streaming of you media content. The Nexus Q is powered by an OMAP 6640 processor, the same chips as the Galaxy Nexus. It is equipped with optical digital audio and HDMI output to connect to your television and speakers, as well as a built-in 25 watt amp. It also features additional connectivity through dual band wi-fi, ethernet, Bluetooth, NFC connection, and a micro USB port that Google says will "encourage general hackability." Users can use their Android smartphones and tablets to choose and control media to play, including music, movies, and TV shows purchased through Google Play. Rather than streaming the media from you smartphone or tablet, the Nexus Q will stream content directly from the Google Play cloud. Google is also billing the Nexus Q as a social streaming device. This means that friends can sync their own Android devices and media libraries to the Nexus Q when visiting, with the Nexus Q again streaming that content from the Google Play cloud. A single smartphone or tablet can also control multiple Nexus Q devices throughout a house, enabling music or video to sync between multiple rooms or televisions. Google is making the Nexus Q available for pre-order starting today for $299 directly from the Google Play store, and will begin shipping the device in mid-July.